Hair loss is something that plagues men and women, and it can certainly affect your self-esteem. There are plenty of products on the market that promise re-growth, but now there’s a new frontier for restoration. Artas debuted at the Wynn this week for the Aesthetics show. It’s a 3D camera, 7-axis robot arm with pinpoint accuracy. Dr. Mark Bishara, M.D. is a plastic surgeon at The Paragon Plastic Surgery in Dallas, Texas. He said Artas is the future of hair restoration. Artas is a fully-integrated system that harvests hair from the back of your head and transplants it to where it’s needed. “It actually makes the incision in the front area of the scalp and then places the hair follicle in that incision,” said Ryan Rhodes, the CEO of Restoration Robotics. Rhodes said a single treatment usually takes 5-6 hours. “I’ve had 2,000 grafts moved from the back of my scalp and transported into the front hairline area,” Rhodes said. 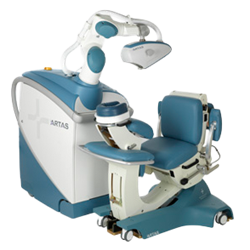 According to Rhodes, Artas is more efficient and less invasive than other methods of hair restoration. He called it cutting-edge of technology to assist surgeons with a problem so many people have to deal with. “About 50% of men over 50 experience some degree of balding,” said Dr. Bishara. Dr. Bisharta reports Artas has already made a difference for so many of his patients. “You can see the self-confidence of people that come back, as their hair comes back,” Dr. Barta said. The cost varies depending on the amount of hair that’s transplanted. Typically, it can be anywhere from $8,000 to $12,000 but according to the company that provides a “substantial” amount of hair. Artas debuted at the Wynn this week for the Aesthetics show.